Sheffield 5 ‹ Series 12 Reversions ‹ Flog It! Antiques series. Paul Martin presents from Sheffield with experts Thomas Plant and James Lewis. Items of interest include a tortoiseshell locket and a Georgian tankard. Browse content similar to Sheffield 5. Check below for episodes and series from the same categories and more! the world's finest steel and finest cutlery for over 800 years. Of course, we're in Sheffield. at the Cutlers' Hall in Sheffield. the city's world-renowned industry ever since. cost the princely sum of £86, three shillings and ten pence. that are worth considerably more than that. ready to see our experts. both working their magic with the crowd. They're all eager to go in. There isn't a minute to waste. So, without further ado, let's open the doors and look at some antiques. Ready, everyone? Come on, then. with over 500 antiques to be inspected and valued. will prove to be a cut above the rest? in the sale room? Don't go away. All will be revealed later on in the show. This trio of grand chandeliers dates to the 1950s. but they're casting such a fabulous light on the crowd below. It's such an exciting atmosphere. Thomas Plant is ready to shed some light on our first item. Fantastic chandeliers here in Cutlers' Hall. And this is a tasty little lighthouse we've got. Paul, tell me how you acquired it? Car boot find. Addicted to car boots. Tell me, Paul, are you in the boot before it comes out? Never go in the boots. -I don't agree with that, you know. -Just as they're getting it out, maybe. So what was the story behind this? which is Doncaster Rovers' stadium. a lady just got it out, just the quirkiness of it. So it's a lighthouse, but what actually is it? I said it's a tasty little light. -..the actual wick and where it would have been fired. a little bit of my thoughts behind it. -OK, we've got a bit of oak round here. You know, maybe a bit of stained beech. -And again, another bit of aluminium. -..who look after our lighthouses. -And this is, you know, a magnificent lighthouse. and passed round this to light one's cigars with. If you were involved in that sort of organisation. And that's what I think it is. But it is 1920s. -It can't be any earlier, can it? Aluminium was really introduced in the first part of the 20th century. out of it and other things. It was a new metal and so it would have been quite expensive. and it's actually been made particularly well. I love the brickwork here and the little windows are great. -Yeah. So have you got an eye for things? 20 cabinet people, sort of thing. It's got to be something like that, just bizarre. And can I ask and be cheeky? Was it one figure pounds or was it two figure pounds? It started at two figure pounds and I got it down to a one figure pound. Are you a hard negotiator? I try my best, yeah. Basically, she wanted £12 for it. I actually paid eight in the end, yes. Even though I thought it were worth 12, but the principle. What's this going to make on auction? It's not going to make massive, massive amounts of money. -But I think we can put it in at £30 to £50. Shows you a small profit. in the early hours of a car-boot sale. I'm sure it will light up the saleroom. Meanwhile, Anita is about to sail into her first valuation. the first thing that struck me was how lovely and shiny that top part was. -Were you up all last night polishing? No, not last night but I do like to keep my silver nice and clean. I do like polishing silver. -You do like polishing silver? Well, we are in Sheffield - the home of silver and silver plate. -Well, let's look at it as a whole. -And it's quite an exciting piece, Sue. -Let's look at the base first of all. and that was between, I think, about 1897 and 1912. So we can be very specific about that date. we had these lovely blue colours and gilt. -When he started up with his own studio. but we see that it has been repaired by these rivets. Rivets, I know. It's always been like that, Anita. It's always been like that? This was repaired a long, long time ago. -Quite soon after it was made. Now certainly before 1912 because there was no superglue. -..the two broken pieces together. And, to me, I don't find it ugly or terrible. I think it's just part of the history of it. It's part of the history. And I come from the Clyde and that has a great tradition of riveting. -So I don't mind a bit of riveting myself. -But what it does do is affect the price. Yes. Well, I didn't know how much it was worth anyway. we would have been £400, £500. But with the damage, it takes away so much of the value. -It would render it to probably under £100. But I think that it's worthwhile putting it on the market. You're very definite about that, Sue. and I don't think my family will appreciate it. Well, let's put it to sale. -Oh, that's a good one. I've heard that before, Anita. -Was that one of mine? we should bring the reserve to perhaps about £60. And I'm hoping that that might fly. Well, I'm with you there, Anita. Thank you, Sue, for bringing it along. Thank you very much. It's been lovely. there's a real buzz around the floor of the hall and above it. Well, it's a fantastic atmosphere at Cutlers' Hall, Sheffield today. The "Flog It!" team are out. something which measures that atmospheric pressure. First of all, EGB - is that a relation? Fantastic pocket or travelling barometer. How did you come about it? My father bought it a long time ago and when he died, I got it. or was he a traveller? Did he like the weather? He was interested in antiques and anything interesting. -with anything that took his fancy, really. -Why have you kept this? I don't know. It's just one of those things that was kept. -And you know it's for measuring atmospheric pressure. And have you had it out of the box? -And there's some information in the bottom. I think we'll have a look at that. But if I just do this, if I just blow on here. so that's quite good fun and it's in this fantastic gilt metal case. We see a lot of these pocket barometers. This one, however, is a bit special. The reason why - it's a good size. A lot of these pocket barometers are half this size. -And they're sort of happy amateur ones. This weather watch, as it's been described, is a real tool. it moves the pressure on here as well. I think we might have to look in here for a bit more instructions. And, of course, we've not even mentioned who it's made by, have we? this business in the 1850s. Mainly doing photographic and scientific instruments. so they are the premier makers of these types of instrument. So why did you bring it today? I was interested in coming to "Flog It!" so that's why I've come today. Is it something you've thought about selling cos it just sits there? -It is not worth £50 to £80. My estimate would be £200 to £300, fix it at £200, the reserve. I think I would like a little bit more on the fixed reserve, please. Oh, you'd like a little bit more? 250? If you really wanted to do that, let's do it. -250 to 350 with a fixed reserve at 250. -Yeah, that's better. Shall we do that? I mean, it's not one I've seen before so it could do rather well. Are you going to be there at the auction? No, unfortunately we're away on holiday. Well, I hope it's somewhere good. Brenda, a fascinating little group here. Tell me where you got them, first of all. his father. So it's my great-grandfather's originally. I assumed they were war medals and they're not. They're not, they're not, they're not. because this is quite interesting. or the Buffs, as they were known. associated with stage hands and theatre people. -was involved in the theatre? So, we can't put any of the pieces together? that this is made of nine-carat gold. Now, I'd like to have a wee look at the script on the back. "for his service in the cause of Buffaloism." And that name, Pasley, is that a family name? -Yes. That was my maiden name. so it's not all such high value. -to sell both of these as a group together. to you would be 150 to 200. -perhaps 130 and I'm sure they'll do very well. Here in the city centre is the spectacular Millennium Gallery. created very much for the workers of Sheffield. on permanent display here in the museum. was one of the greatest figures in the Victorian era. and he left a lasting impression on the city of Sheffield. on business trips around Britain and continental Europe. Turner was far from the great artist we know today back then. was condemned by the British press and the art world. they were the ones that produced real art. Nowadays, the book is regarded as a classic. and Ruskin as a powerful voice to be reckoned with in the art world. Ruskin's passion for art wasn't just about celebrating famous painters. to the mightiest of landscapes. means you're enriching your lives. And I can understand what he's getting at. Look at the example here. A collection of shells and some coral. Look at the shapes, look at the forms as well. Nature gets this so right, it's not contrived. This is what Ruskin was going on about. was that he believed art should be enjoyed by everyone. It shouldn't just be something to adorn the walls of the wealthy. In 1875, Ruskin made this idea a reality. on a hillside location and set up the city's first museum. who were losing their skills to mass production and machinery. to the lives of people working and living in terrible conditions. out to the countryside to appreciate nature. to allow factory workers time to make the journey. The museum may have been small but it was a huge success. of flowers and birds, like these ones here. He even added a collection of coins, geology and a library. it had to be moved to bigger premises. was given a new permanent home right here in the centre. Sheffield is not the smoggy city it was 150 years ago. This is just a small part of what Ruskin left behind. The rest is in storage. 'I've got the chance to look at it with curator Louise Pullen. This is an enlargement of each individual filament here. He wanted to show the beauty of detail of the different colours. He was a very talented artist? All of these drawers are full? -that Ruskin collected the majority of. by being enlightened, in a way, by things he found beautiful. start drawing, start being aware of what was out there. of Sheffield knife grinder Benjamin Creswick. a beautiful bust portrait was produced. -This is an example of it. A man of many talents? he ended up as model master at Birmingham School of Art. -championing it and giving it a fresh start. Louise, thank you so much for talking to me. This is a real joy. Ruskin is one of my heroes and I can literally spend days in here. played a big part in his life. The collection is a testament to John Ruskin himself. It's wide-ranging, it's ahead of its time. the collection is still growing and it's inspiring people today. turning up at our valuation tables. but right now we've reached our halfway point in the show. the items that are going under the hammer. but Paul managed to bag this light in the early hours in the sale. Will it spark the bidders in the sale room? but I'm sure it will make for a riveting auction. Brenda's Buffalo medals are a real family heirloom. Can they cause a stampede at the auction? but can it also fetch a stratospheric price? We don't have to go far to find out. just across town at the Sheffield Auction Galleries. This is it. The sale has just got underway. there is a commission to pay. Here it is 15% plus VAT, whether you're buying or selling. so let's catch up with our owners and get on with our first lot. machined from a chunk of aluminium into a lighthouse. I love this. It belongs to Paul. It was a car boot find? -Do you do many car boots? -Four o'clock on a Sunday morning. -Four o'clock on a Sunday morning! You see, you've got to get up early. It is out there but you've got to get up early. -No, not at four in the morning. this is one of my favourite things in the sale. Getting rare, this lighthouse material. £12 is your start price. But I'm out too soon. Who's on 22? Someone in the room is very keen. £30 bid at the front. 40 with the lady on the front. It's got to be 45. It's going to go. 50, new bid. The gentleman standing at £55. Have we done? Hammer is going to drop. and that's what it's all about. That's a nice thing. -Couple of bottles of rioja. I'll get back out there on Sunday and see what happens. And next up, not quite in perfect condition is our second lot. Oh, crumbs, guess what's coming up next? Yes, it's that broken biscuit barrel. Rivets! Who put those in? I don't know. It's old, it's always been in it. Do you know? It is great because it is Moorcroft - Macintyre Moorcroft, I love it. But the damage will let it down a bit, won't it? from Macintyre and Co, the pottery biscuit barrel. I must start it at £55. Top of the shop at £90? Are we all finished? The hammer is going to drop. There you are, the hammer has gone done. but it went eventually after 30 seconds. Going with me at 95.
going under the hammer. One silver and one gold. I think the price is spot on. marvellous medal with this great Buffalo head on the top. -And it's unusual, isn't it? Right, let's put this to the test. Here we go. Good luck, Brenda. Nine-carat gold Buffaloes medallion pendant. We've got a silver medallion pendant - philanthropy. Commission starts this...hold on. 140, 150, 160, 170, 180. In green. 190. 200, sir. 210. 220 and I am out. The gentleman in green holds it at £220. Got to be 230 elsewhere. They're going to go. On my left at £220, are we done? Oh, that's good. £220. Happy? -Were you getting worried slightly? at that, the rest is a big bonus. Nearly £100 more. Well done. is on holiday and missing all the auction action. I think this is real quality. Negretti and Zambra, the best London maker. They did great scientific instruments and this is one of them. This is for your proper ballooner. Let's gauge what it does right here, right now. This is it. of London. A great name. Another plus point, we've got the original leather-covered case. I must start it at £200. 210? It needs to be to move on. I'm out. But I'm out too soon. 260, it needs to be. -It's only just started, hopefully. -260, 270, 280, 290, 300. -This is more like it, Thomas. -It's much more like it. -Two serious phone bidders having a battle. Shout out if we have missed you. Anybody else wants to bid? It's going to go at £320. -and they will be over the moon with that result. £50 bid on the internet. Anybody else for 55? Sold! Well, there you are - our first three lots under the hammer. You certainly need nerves of steel in an auction room. Thank goodness this is the city of steel. There's plenty of it about. through our country's darkest hour. I went off to find out more about them. it also became famous for mass production. to produce more steel than any other city on the planet. This was a heavy industry of massive machinery and punishing work. Working in the mills was tough. At times, dangerous business. It was seen as a man's world, but all that changed in 1939.
to meet the demands of modern warfare. like this massive great big Grand Slam bomb. It weighs ten tons and was made by Vickers-Armstrongs. it could be made right here in Sheffield. factories struggled to keep running. It was then that the women of South Yorkshire were called upon. to the war effort, had to register at the labour exchanges. in the steel mills during the war. You were both told then just to turn up for work at the factory. It must have been quite daunting to start with? It was either that or the Army or the Land Army. and I couldn't pick and choose where I wanted to go. Were you frightened on your first day at work? the stench, the smoke, the fire. I used to think, I'll never be able to stick this out. What did the men think at the time? Were there still men working there? -They didn't think a lot of us, did they? I expect the language was quite shocking in the factory as well? You weren't used to that sort of environment, were you? You learned words you never knew existed! till they were more or less like ribbon. We never knew what they were meant for. -I was in the steel foundry. wheel it right down the foundry, under Bessemer that would be going. you were expected to take this mixture down to him. "you'll get used to it. You'll have muscles like me." but the work wasn't just strenuous, it was also dangerous. -and people lost fingers, they lost hands. -Did you ever get injured? I did hurt my back pretty bad one day. -and I still have back trouble to this day. It was jolly hard work and never got a thanks. Nobody ever thanked us when we left work. But what an achievement though! Without the women, these factories would not have run. But they couldn't have done, no. No. to the attention of the local newspaper. were given the recognition they deserved. We were all in a sort of a dream. We just couldn't believe that it was happening. It's marvellous. It's marvellous. It's taken a long time, hasn't it? -..on the 12th of January. Wow! Well, you don't look it. you both are heroes to this city. You really are. And I think it's fabulous as well. -We've had a long life and we're still here. producing vast quantities of the finest steel, machinery and cutlery. have now been recognised and given a place in history. there are still plenty of antiques to be valued. that is a real part of this building's history. and its association with Sheffield steel. imported live via the Liverpool docks. have been harvested for their shells as far back as Roman times. that can be used in all sorts of products. for the handles of knives and forks and of razors. Now, there's 13 sections on the shell. You can see them here, look. One, two, three, four, and so on. fused to create a thicker section. This makes the shell look a lot darker. It can also be carved. It can be tooled and fashioned. like brasses and pieces of silver. But, thank goodness, this trade was banned by CITES in 1973. Today, we use a modern plastic. It looks just as good and you wouldn't know the difference. So it means a happier life for these fellows. because those made before the ban can still be sold. And Anita has a particularly fine piece on her table. along at "Flog It!" today. Can you tell a little bit about it and where you got it? and she acquired it, I think, from a friend, many years ago. -So why pass it on? Is it not something that you would wear regularly? Well, I don't have any daughters. but I don't think she's one to wear tortoiseshell. Think about the date and time that it was made. So it has a good age and it is encrusted with this gold decoration. -It is gold, is it? -I would say that it is. and it is a nice combination. where the gold is inlaid into the tortoiseshell. But this is... It's like overlaid, but it's very sweet. If we open it up, did you keep photographs in here? and he died quite a few years earlier. to someone who will enjoy it. We have another Victorian piece here in the chain. and they kept maybe little watches or little pencils on it. so this has been split and the catch here is not original. -That's been put on at a later date. So it's quite a nice wee Victorian lot. who wants to collect Victorian stuff. Price on it, you're maybe 100-150. Would you like to go ahead and sell it within that estimate? Yes, yes. That would be fine, yes. You're not going to miss it? so it would go towards that. I think that's... That's a very good thing. that there are lots of Victorian jewellery collectors at the sale. and see what treasures they've brought in. Meg, have you got the time on you? I'm looking there. It's quarter to 12. -I fell for that one! -I see you're holding that, you're clutching that. Is that quite precious to you? It's a bit of Staffordshire pearlware. -I found it in a charity shop. -About two... About 18 months, two years ago. -Do you mind me asking how much you paid for it? Well, that was a very good buy, wasn't it? I used to collect early Staffs as well. -You know all the flat back figures? Designed to go on a mantelpiece against the wall. -Do you know it's pearlware, do you? because you can see there's a blue tinge to the glaze. -Yeah? I would say this is circa 1810, 1820. I like the two characters leaning against these faux-marble columns. Can you see they're faux marble? Like the columns here in the building. Painted to look like real marble. Can you see there, there's some damage? -There would have been a cartouche there, or a scroll. Just acting as a pediment, architecturally quite strong. and this was a powerful message back in the 1800s. all with messages of religion. I think this is brilliant, I really do. And I think we'd put a value of £80 to £120 on this. this would realise in the region of £400-500. -I'm quite happy with 80 to 130. I know you are. I bet you are. Now, are you sure you want to sell it? and so she's off to Vietnam. what I'm holding is Fern's spending money in Vietnam. -and I can't wait to see you in the auction room. Thomas has dug up a very unusual item. what is unearthed at these "Flog It!" valuation days. It certainly did in the past. Tell me, what do you know about this? Not very much at all, really. I acquired it recently in the last two weeks. Have you done some research? cos I didn't know what it was. to sort of rub over your hair to make your hair grow back. This one was obviously to go over parts of the body, I'm sure. plug yourself in, and end up rubbing yourself down with this. I mean, that's really quite a rare Bakelite plug in there, isn't it? I don't think it's ever been used. who might be interested in this. -What do you think this wood is? -This is going to be beech wood. -The date of this object, I would say, 1940s, 1950s. -I don't think it's pre-war. It looks in too good condition. it's got to be worth 30 to 50. -I thought about 25 to 40. You should be doing my job. No reserve on this. It's got to go. Otherwise it goes in the bin. -Let's hope we're shocked at the result. OK, that's enough of the puns, Thomas. Anita, please restore some decorum to the proceedings. Pat, this is a wonderful item. -So it's a marvellous item. Tell me where did you get it? who lives in Boston, Massachusetts. mother and father lost all of their money during the Wall Street crash. at that time and said to him, "If you ever need money, sell it." Well, he died at 95 and he didn't sell it. And he hadn't needed to sell it. but he didn't sell it. Yeah. It's quite an impressive looking little guy. It didn't start off life, however, in the 1760s like that. and none of this embossed work on it. and this has been elaborately worked on. all sorts of busy decoration on the body. And when we turn it round, we see that it has become a pouring vessel. but I don't know whether he knew that it was embossed later. with the style of the period that they live through. and I kind of think that this lid has been pushed up a little bit. So, tell me what are your thoughts? Did you like this item? and had I not seen the advertisements for "Flog It!" I would bring it along and that's what I've done. during the course of its nearly 300-year-old life. As it is, in today's market, I would put an estimate of £300-500 on it. -Would you feel satisfied to let it go forward at that price? Yes, if somebody wants it. rather than it's in the back of my cupboard. and that's what "Flog It!" is all about. So we'll put it to auction, 300-500. We'll put a reserve of £300 if you wish. Well, that's it, our experts' final choices. You've just seen them. And what a day we've had here. and fetch enough to get her ring repaired? but let's hope this set sparks some interest in the sale room! but I'm sure it could be meeting a new owner. that lies just below the surface. and Robert Lea is in full flow. He's fast approaching our lots. First up is the exquisite tortoiseshell locket. Georgina, you're a woman of style. I think it's beautiful. Why don't you want it? I always thought it was a bit like plastic. which are more sort of like costume jewellery, which I actually prefer. and I love tortoiseshell and it really is just a cracking piece. -It will suit today's market. -Yeah. Anyway, look, good luck with that. -Good luck. We're going to put that to the test. with a pique-style inlaid detail. Must start the bidding at 85, 90. Five. 100. 110 I'm after. Gentleman in the room. 140, 150 now. 160 I'm after. 150 in the room. Look at this. And there's a telephone come in. 180 on the internet, 190 I'm after. 180 bid on the internet. 190, new bid. In the room. 220 I'm after. 210, room bid. 240 I'm after, 230 in the room. 260 I'm after, 250 in the room. -It's got to be 260 now. 260, 270, sir. 280, please. 270 the room. 280, 290. 300 I'm after. 320 in the room. 340, 360. 380 I'm after. 360 in the room. 380. £400. 380 with the internet. Anyone? £400 for it. It's going to sell at 380. One last look. All done, are we, at £380? -That was a nice wee surprise! You must be over the moon with that. -And quite a few people saw that. we had the phone and we had a lot of competition in the room. Now I'll be able to get my engagement ring repaired. so it's going to be nearly £100 to get it repaired. Well, that will sort that out and then you can wear it again. and hopefully that locket will adorn its new owner. But I'm not so sure our next lot will see much use. Carol, let's hope we don't get arrested right now. We're about to give the bidders a bit of high voltage. Yes, it's the electrotherapy treatment machine. No reserve, it's here to go. -Have you had a few laughs with that at home? Well, I was only given it recently by a family member. So no-one's seen it, actually. -You haven't plugged it in? You could have had a few practical jokes with this one. 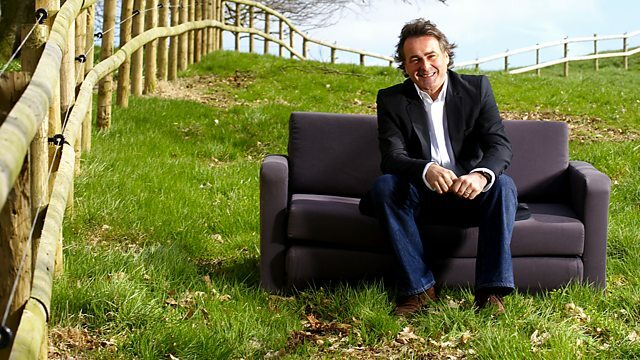 -bring it on to "Flog It!" and sell it. OK. Cracking little thing, really. -Well, they're quite weird, aren't they? You know, we don't really do it now. with assorted glass wands in a fitted wooden case. I've got commissions. £28, 30. £45, it needs to be to move on. Anybody else fancy it? It's going. Give yourself a shock! With me at 40. All done, are we? At £40. That's good, £40. That's cracking. That's really good. I'm happy with that, yeah. That's going to end up in a bygone museum somewhere, I would imagine. -Or on a dinner party table. -Put your finger in that! because it gave us all a big laugh at the valuation. Prepare to meet my valuation. Yes. Guess what's coming up. Meg, good to see you again and here is Andrea, Meg's daughter. I'm hoping for that top end of 180, maybe £200. -I like this. I like it a lot. Fingers crossed somebody else falls in love with it as well. -I love it and you love it. are also going to love it. That's what it's all about, isn't it? -Let's put it to the test. Here we go! A bit of damage on it, but it hasn't detracted. Commission bidders. They're willing to start the bidding at £420. 600. 620. £600 bid on commission. It's going to sell. One last look around. Bid now or lose it. With me at £600, all done, are we? Ooh, I'm shaking for you. -would you have kept it? No. You wouldn't have treasured it. -You'd have still sold it? -Think of the money. Think of the money. I think we'll have a bit of a party as well now. That's what the show is all about. -Meg, enjoy that money, won't you? 22, £20 with the internet. we've still got a value of £300-£500. -There's a lot of silver there. -There is a lot of silver. -Well, I'm hoping that it will do its £300. and the purists would have liked it as it was. Sure. This is it. Here we go. 1763, later converted to a jug by the Victorians. Lots of interest on it. Lots of interest. It's not going to melt, then. At 420. 440. 460. 480. 500. 520. 550. 580, sir. -This is what auctions are all about. 580 on the phone. 600. That phone bidder is desperate for this. Look. What a cracking result! Just shy of £1,000, Pat. You've got to be over the moon with that. I'd be hopping up and down right now. Well, it just shows you, we really didn't know at that point. £300, brought to auction and the market decided. What a way to end the show here in Sheffield. With Pat over the moon. it just goes to show there are always surprises in an auction room. Paul Martin presents from Sheffield, where he is joined by antiques experts Thomas Plant and James Lewis as they search for interesting and valuable items to take to auction. Among their finds are a tortoiseshell locket, a Georgian tankard and an electrotherapy kit. Paul meets two Sheffield women who were recently awarded honours for keeping the steel mills running during the Second World War, and he also tells the fascinating story of Victorian art critic John Ruskin's influence on the city.